As we head towards the NBA’s marquee Christmas matchups and edge past the quarter season mark, we got the Same Page gang together to answer three questions about this bizarre season of basketball. Join Daniel Reynolds, Dan Grant and Dave Game6ix Osubronie as they attempt to go Three for 3. What is up with the Eastern Conference? The Knicks and the Nets were set to play each other back on December 5th. The media asked the rookie coach of the Nets how he felt about the impending match up. Instead of trying to say something uplifting or try to ignite his new team, he simply said, “It’s the rivalry and both teams stink”. We have to give him credit for being honest right? Both teams have failed miserably to live up to expectations so far and they’re not alone. As of right now only three teams in the Eastern Conference are above .500. and to me there is only one reason: Bad Coaching! Jason Kidd, Mike Woodson and Mike Brown are all one spilled drink away from the unemployment office. All of their respective GM’s have stood behind their coaches, while collectively holding a 26-48 record. The Nets and the Knicks really have no excuses because they have superstars on their rosters. Even with the injuries their teams have sustained, Kidd and Woodson should be able to help them excel to the top of the Atlantic Division. Instead, they have made horrible strategic decisions and cost their teams many winnable games. Mike Brown is ruining Kyrie Irving’s rising stock as a superstar, while standing idly by as Dion Waiters is about to be traded away. He has absolutely no control over the team he is paid to lead. I will never understand why Dan Gilbert thinks he can relive the days when Cleveland got to the NBA Finals. Lebron was the only reason they got that far. The Lakers tried to see what Brown could do and we all know how that turned out. Can someone give this man the death stare already so he can be fired. Cleveland has been through enough, hasn’t it? P.S. Out of respect for my hometown team, I decided to leave Dwayne Casey out of this. He is just as inept as the other coaches mentioned, but I know he will not last the full year behind the bench because I BELIEVE IN MASAI! Inept – This category is reserved for teams that are actually trying to be competitive, but through a series of ill advised personnel moves, stupid contracts and/or bad coaching, they’ve failed to succeed on any level. Currently, even in such a terrible conference, all four of these teams are sitting outside the playoff ‘race’. There’s still plenty of season to go, but all of these teams have to be disappointed with their start. Milwaukee Bucks (5-20) – Larry Sanders has barely played because of an off-court incident, but can that be the only problem? New York Knicks (8-17) – 4 eight figure contracts! 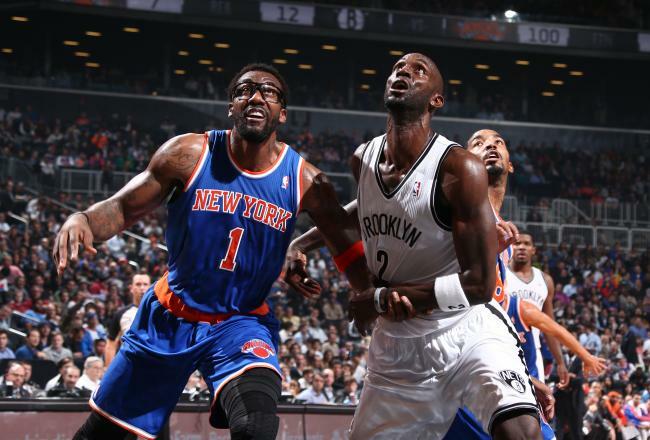 32 million dollars worth of Amar’e and Andrea. Cleveland Cavaliers (9-15) – put the ‘fun’ in dysfunctional! Inconsequential – These teams are an eclectic bunch; they’re either in the early stages of rebuilding, outright tanking, have been decimated by injuries or just aren’t good enough to contend this year. Several are sitting in playoff spots currently and while that may hold true come April, they’re not going to matter come playoff time. Boston (12-15) – 4 seed and Division leader! Detroit (13-14) – Monroe is on his way out of town. Andre Drummond! Charlotte (12-14) – Your powerhouse 6 seed! Toronto (9-14) – Is Rudy Gay the ultimate Ewing Theory candidate? Not if Masai has anything to say about it! Chicago (9-16) – So sad. Orlando (8-18) – If this team gets Andrew Wiggins or Jabari Parker, watch out. But that’s next year. Philadelphia (7-19) – Evan Turner’s emergence is the only reason this team has even won 7 games. Intrepid – Miami (19-6) – Can the Heat three-peat? Winning on the road in Indiana will be tough. Look for them to turn it up in the 2nd half and try to get the 1 seed. Indiana (20-5) – Indiana has really come into its own this season as a defensive juggernaut. Atlanta (14-12) – Danny Ferry has done a great job remaking the Hawks team and could go either way before the playoffs start. Regardless, there has to be more than 2 relevant teams and the current Hawks would give a tough series to whomever draws them. There is no parity in the NBA. We all know this. There are teams that are championship contenders, teams that are terrible and then that great, awful middle ground. In the Western Conference over the past decade, groups of teams have fought against the notion of “top heavy”. Sure, they have usually been only a couple of really strong title contenders – your Spurs, your Thunder, what have you – but the 3 through 8 seeds also felt they could compete. This got people excited. The Western Conference still engenders these feelings. Not so, the Eastern Conference. This was supposed to be the year when as many as six teams would duke it out with the reigning champion Miami Heat all season long. It was supposed to be the year of battles fought across boroughs, of reunited warriors waging an endless campaign, of terrifying upstarts surging into the fray. Aside from the Pacers (who continue to bark furiously at anyone nearby) and aforementioned Heat, the entire conference has misfired. We have seen only wanton, aimless destruction and decay. The players are all there, like the pieces of a Risk game scattered from a box, but none appear in the right time or place. Kyrie dribbles, Wall streaks, Horford remains heady, Carmelo binges, Lopez bulls along, Rose cries. Somehow, it seems so confusing (and not just because I talked up the Nets as title hopefuls last time we were here). Things were not supposed to go this way. In almost every case however, management of these teams – these armies – has been suspect, misguided, and woefully inept. The Cavs picked players poorly and set themselves up with a terrible coach (Mike Brown). The Nets and Knicks wagered on all the wrong players (and in the process, completely mortgaged their future). The Wizards remain resolutely clueless; same goes, somewhat, for the Pistons (yes, yes, Andre Drummond!). The Bulls destiny was tied to a single knee. No, none of it was supposed to go this way, but basketball, like war, is sometimes hell. Welcome to the Eastern Conference. Not the matchup it should be. Which teams do you think are making it to the NBA Finals? I can hear the hesitation is our editor’s voice whenever he asks me to write about the NBA Finals and my prediction. He knows I’m going to write about the Miami Heat and so do I. The only question is who would be my prediction for the Western Conference champ. Back in October I had faith in the Los Angeles Clippers, but who knew the Portland Trailblazers would be this good. Even though Oklahoma City leads the West by one game, Portland is the team to beat and the likely opponent for the Heat. As long as Lebron James is alive, Miami will be the team to beat in the East. He has led the team to a 19-6 record and most recently, an impressive win to even the score with the Indiana Pacers season series. 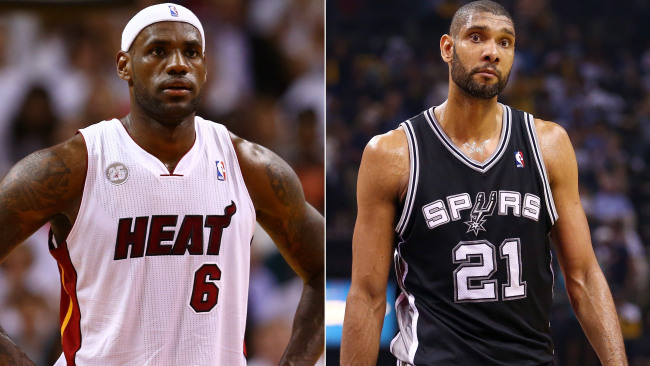 With Dwyane Wade on the “Tim Duncan plan“, Lebron has the green light to run the team as he sees fit. Every player on the team knows the only goal this season is to rest up and be ready in the playoffs. Miami has a deeper bench led by a familiar face in Michael Beasley. He has become a spark plug off the bench, scoring 11 points a game, and could be very valuable in the playoffs. With the sad excuse that is the Eastern Conference, the Heat could end up resting a lot of players and be in great shape with home court advantage in April. After losing their first game to the Suns, the Trailblazers looked like a team without a clue. Then they won 17 of their next 19 games and Rip City was alive and well. It would be dumb to ignore that Damian Lillard has a lot to do with the way this team has played. Dominating other point guards and shooting 3’s from wherever he damn well pleases, Lillard has shaped this team into a contender. LaMarcus Aldridge finally has a teammate that can create his own shot and thus has flourished in the post, while averaging 23 points and 11 rebounds per game. Wesley Matthews and the “Olympic nut puncher” have been a great supporting cast spacing the floor and scoring 16 and 14 points per game respectively. If they can all keep playing at this level and stay healthy, then the Trailblazers will be headed to their first NBA Finals in 12 years. We will have to wait till December 28th to see these two teams match up for the first time this season and only then we will be able to see if Portland will be a worthy opponent like the Spurs or have their youth exposed like the Thunder. The last NBA Finals rematch was back in 1998, when Michael Jordan’s Bulls knocked off the Malone/Stockton Utah Jazz in 6 games. Re-matches aren’t things that have happened much since the ABA merger, despite just nine total teams winning the title. The Lakers and Celtics, for all their history, have done it just once, in the 1983/84, 1984/85 seasons, splitting the decisions. The Lakers also met the 76ers in back to back seasons between 1980-82, splitting those as well. The Pistons have done it twice too, meeting the Showtime Lakers in back to back seasons in the late 80’s and the Spurs in the mid aughts, splitting both. Toss those in with the aforementioned battles between His Airness and the Mail Fraud, and we’ve got ourselves a complete list. This season, it looks like we have a great chance at adding a match-up to the list, as well as a potential new wrinkle: the three-peat sandwich! The Miami Heat are definitely making the Finals, if Dwyane Wade can stay healthy. They proved on Wednesday that while the Indiana Pacers are improved, they don’t have the horses to compete with the Heat when Miami is firing on all cylinders. The Heat outscored the Pacers by 20 in the paint, surprising considering they’re supposed to lack a low-post threat. They also have LeBron friggin’ James, who might win his third consecutive MVP award (and fifth overall) this season. In the West, one of Miami’s previous dance partners is likely to make it through. People have been so obsessed with criticizing the Thunder for trading James Harden that they’ve sort of missed the fact that Kevin Durant has become the single best offensive player in the league (Iceberg Slim!) and the leading candidate to foil LeBron’s MVP candidacy. His partner in crime, Russell Westbrook (a.k.a. Furious Stylez) is a dynamic back-court force that is unrivaled in the NBA, in terms of pure athleticism and power, from the guard position. If the Thunder make it through and lose to Miami, we’d have a three peat sandwich! Since the merger, Michael and Scottie’s Bulls three-peated twice and the Shaq-Kobe Lakers did it once. In those nine finals, they played a surprising 8 different opponents. We had Lakers, Blazers, Suns, Sonics, Jazz, Jazz for the Bulls and Pacers, 76ers, Nets for Shaqobe. If Miami can pull it off this time, they’ll be the first team to sandwich victories over one opponent around a different one! Shut up! it’s a smart concept with a cool name that a sophisticated audience will appreciate! Speaking of that ‘different one’, the one everyone forgets year in and year out, let’s not sleep on the Spurs. They basically came as close to winning the Finals last year as you can without actually doing it and they’ve brought back nearly the exact same team. Maintenance of veterans is always a key factor for San Antonio, but in a year without real Kobe and several teams in transition, the Spurs are in a position to add a second volume to their grueling rivalry with Miami. Get ready David Stern, it’s coming: The San Antonio Spurs versus the Indiana Pacers. A match made in TV ratings hell. Two small market teams. No obvious charismatic superstar players. A stylistic mismatch. A coaching chess game. Stop me if you are worried. Ah, but let’s take a minute. Maybe it’s the Blazers? They’re fun, right? They’ve improved their bench but I’m not counting on Joel Freeland and Thomas Robinson for much. These guys want to run against Boris Diaw, Marco Belinelli and Manu? No. The Thunder? I can almost guarantee a case of the yips for everyone on that team not named Kevin, Russell or Serge (don’t worry though, Kendrick will be game for anything). The Clippers? The Rockets? No, they’ll fold. The Spurs are in. You want the Heat. I know you do. I want them too. You saw the Finals last year. It was the Spurs, yes, in all their Spurs-ian glory, doing their Spurs things (Parker with his crazy leaner to win Game 1, Manu coming to life out of nowhere, Duncan being Duncan). But the Heat create the memories, they shape the narrative. You want the Heat in the NBA Finals. But lo, there is one team (and only one team, clearly) that can and will make it out of the Eastern Conference: dem Pacers. Yes, the Pacers want to slug it out, yes the Pacers have a superhero player (Paul George), yes they are well coached (Frank Vogel), yes they even have some wild personality (Lance! Lance! Lance!). They have all that, and more. They have a stinging Game 7 defeat (like the Spurs! ), they have something to prove. And they also have more size, more muscle, more anger. You may want the Heat but that’s OK. So do the Pacers. What has been the weirdest story line so far in this weird season? 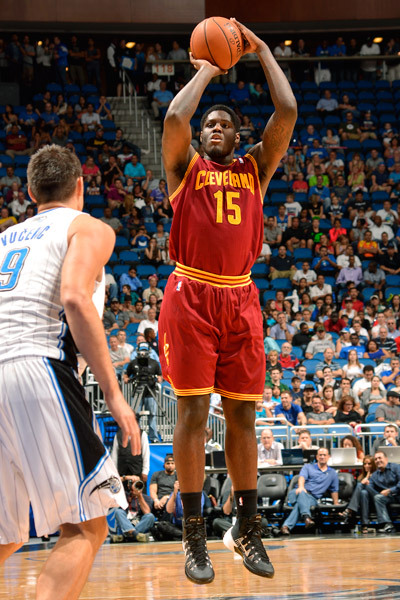 To be fair, everyone was shocked when Anthony Bennett was selected first overall in the 2103 NBA Draft. We knew he was a great Power Forward at UNLV, but no one could make sense of Cleveland picking up another big man in are already loaded front court. Followed by being complete bust on the court to start off the season, this has to be the weirdest storyline of the season so far. Part of the blame for Bennett’s horrible start has to go to Dan Gilbert and Mike Brown. Gilbert for selecting Bennett first overall when he already has Tristan Thompson (one of the first round picks from 2011) playing the same position. Mike Brown gets some of the blame because he has no idea how to effectively use Bennett and has chosen to play him for a mere ten minutes a game. I guess Brown had no other choice but to have Bennett move to small forward, although since he’s never played the position before in his life, you can see why this choice was trouble. Bennett himself also has to take responsibility for his poor play because he came into camp twenty pounds overweight. I guess he let the hype of being the first overall pick get to him over the summer and decided to do absolutely nothing to improve his physique. To top it all off we, found out in training camp that he suffers from asthma and a sleep apnea. Mike Brown has stated this is why he was overweight, but he has these same problems in college and he was in top form then, so I don’t buy this as an excuse either. Although we have to blame his embarrassing 2.2 points per game on something right? Recently Bennett has lost the excess weight and is watching tapes of himself back in college in hopes to once again become that dominant player. I, along with the rest of Canada, hope he can once again become that player. Somehow the Americans will find a way to blame him being the biggest bust in NBA history on him being from Canada. So either he finds a way to vastly improve or we wait till another Canadian college player becomes the first overall pick. Who knows when that will ever happen. It has to go to the Brooklyn Nets, doesn’t it? Their abysmal start, spawned by the abrupt aging of Kevin Garnett and Paul Pierce, the suddenly devastating injury prone-osity of Deron Williams and Brook Lopez, Jason Kidd’s intense growing pains as a head coach, the heavy involvement of a Plumlee, the Soda Cup fiasco, the revelation of Lawrence Frank’s crazy contract and his subsequent relegation to obscurity… I mean what else do you want? Oh, a crazed Russian billionaire owns the team and might continue to pile on the crazy, you say? With the assistance of Billy King? Well, Merry Christmas NBA fans! Honestly, what can you say? The Nets were always going to count on Deron Williams to lead this team and they haven’t had him. Since he’s been back he’s looked All-World, with two straight double-doubles and Paul Pierce/Joe Johnson shooting the lights out around him, as was envisioned by many of us in the off-season. The most important word in that last sentence is ‘two’. If Williams can’t stay on the floor, the Nets are screwed. That said, the Atlantic division is so unbelievably terrible this season that 35 wins might get them them the four seed! I’ll say they still win around 45 games (note: they’d have to go 36-21 from here to do so. Doesn’t that sound doable in the East?) and wind up taking the division over the Knicks, as Boston/Toronto/Philly head into full fledged poop mode. Heading into this season, with talk already focusing on the upcoming draft class, it was clear that a large handful of teams were planning to tank. The Utah Jazz gleefully welcomed Richard Jefferson and Andris Biedrins onto the team, the Philadelphia 76s announced that their recently drafted centre Nerlens Noel would sit out the year (this after they traded their new All-Star PG Jrue Holiday to get him), the Phoenix Suns breathlessly reported their reuniting of twins (Markieff and Marcus Morris), the Orlando Magic happily rolled out an admittedly talented young squad led by such veteran luminaries as Glen “Don’t call me Big Baby” Davis and Jameer Nelson, the Celtics offloaded all of their veteran players, and the Raptors dumped Rudy Gay before he even played a full season for the team. It was all going according to plan. For the majority of these teams (plus the poor Milwaukee Bucks forever dreaming of just reaching the 8th seed, and the Sacremento Kings forever dreaming of a game of basketball with no defense), the plan appears to be working. So why mention this? I mention it because of those couple of instances when the incentive to tank butts right into the desire to compete. Look at the Sixers, for a couple of weeks there they seemed invincible. They fell to earth, but damn, it was exciting. And how about the Suns? It seemed like they were assembled by accident; an odd backcourt of Eric Bledsoe and Goran Dragic, a thin front line (the aforementioned Morris twins, something called Plumlee and the ghost of Channing Frye), and a new rookie coach (former sharpshooter Jeff Hornacek). But lo, they are 14-10 in the Thunderdome, I mean, Western Conference. Incredible. Even Boston, cleaning house with extreme vengeance, find themselves with a surprisingly well-prepared team (thanks to rookie coach Brad Stevens) and a coming saviour in Rajon Rondo. And finally, our Toronto Raptors. Masai Ujiri traded Gay and we rejoiced. So, while the team isn’t exactly slaying giants (they got demolished by the Spurs shortly after the trade), they are playing better, more cohesively, at a higher efficiency. Amir Johnson moves like a man released of a heavy burden. On the one hand, all those prospects, but on the other, competitive dignity. It feels odd to even have this discussion. I mean, why play the games if not to win? What a weird season it has been indeed. Cue every Cavs fan: Noooooooo!